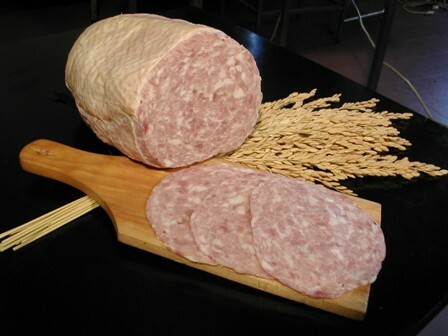 Goose salami is a specialty of Lomellina, an area in the province of Pavia, in Lombardy, which is delimited by the rivers Po, Ticino, and Sesia. Thanks to the abundance of grazing herbs and freshwater springs, goose farming has been practiced in this area since ancient times. The town of Mortara, which gives its name to the local salami, is the historical and geographical center of this territory.